nervous and excited to give it a try… I set out this morning for my very first HOT YOGA class here in Folsom at Bikram Yoga. Getting healthy and living an active lifestyle is very appealing to me. I knew this was a step in my journey. And something that I must do. Man-O-Man that seemed like a long time to do yoga! As a newbee I wondered if I’d last that long… but I was willing and ready. Heather was the class instructor. She put me at ease right away. She said for the 2 first-timers, our goal is just to stay in the room for the entire 90 minutes. Well heck, I can hang out for 90 minutes. No problem. I got it. I was feeling confident now. It started out with everyone getting a floor space. Putting down a long skinny mat with a towel over it, facing the long wall of mirrors. Thinking back – I’m surprised we didn’t fog up the mirrors. That would have been funny. I knew I was going to have to listen and focus if I was going to get into the pose. A couple were very easy, and a couple were pretty advanced. I realized that if I was going to eventually do some of the poses …I’d have to strengthen my core. Something I definitely need to work on. It's a lot like Golf. It looks Easy. Balance and focus were needed when we got to the one leg pose. My right leg – could not stand still. My left leg, well have a look! Balance... Pretty Good for a first timer! What struck me was the care Heather showed in this class towards the students and her knowledge to guide us verbally through multiple sequences of poses and rest. I completed the entire 90 minute class! I was willing to take a risk today and try something new. I am so happy I did. Getting healthy and living a full life means getting out of our comfort zone. 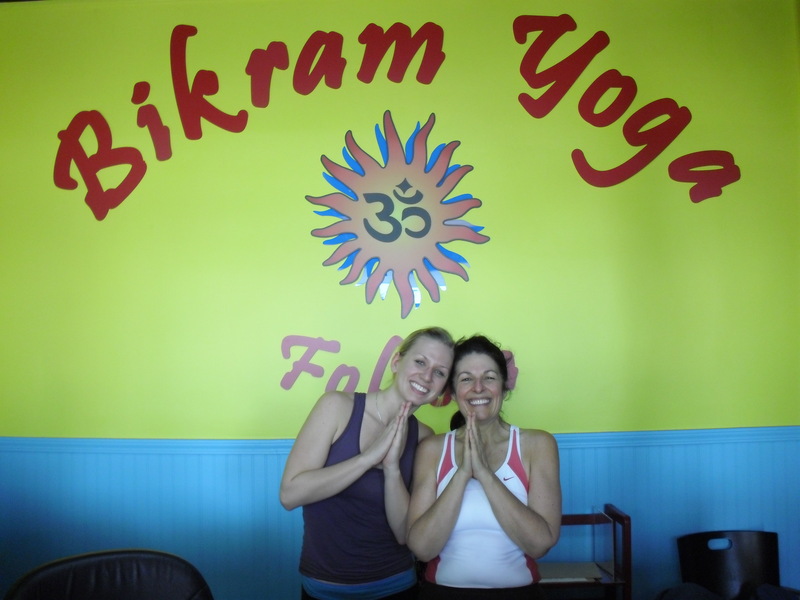 If you are in the Folsom Area, Karen Fitzpartick the owner of the Folsom Bikram Yoga is hosting a FREE Class this Thursday, Nov 19th, 2009 at 6:30 pm. If you want to try it out… I recommend it! This entry was posted in Joyce's Blog Notes and tagged Bikram Yoga, CA Hot Yoga, Folsom, golf, Karen Ernst, Karen Fitzpatrick, Riley Street, Yoga. Bookmark the permalink. HealthYoga.com is a Yoga Social Network for both the consumer and professional public. The sole purpose of HealthYoga.com is to offer a free outlet to the public for those seeking advice on a variety of yoga related topics from professionals. It is the only social network of its kind, directed specifically towards those in the yoga field with chat and web cam capabilities. I have come across your website and have noticed you link out to great resources online, we would love to be included within the list of great resources you acknowledge online. I appreciate your time and await your response.